Welcome to DECKER'S HOT CAMP SHOWERS website. DECKER'S is your one stop shop for camping showers and portable hot water heaters. We carry everything from propane and vehicle mounted hot water shower systems to campfire and stovetop water heaters and showers. We have shower enclosures and even complete portable bathrooms. We have products that are suited for outdoorsmen and campers as well as military, firefighting base camps and natural disaster or emergency relief and decontamination. Now your outdoor adventures can be more civilized by adding the convenience of hot water. 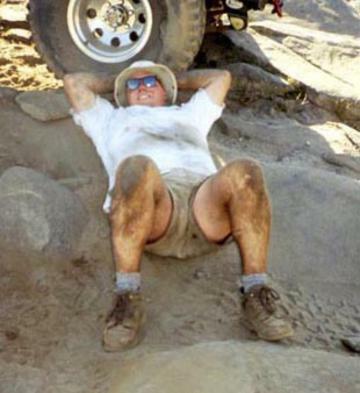 Imagine being able to take a nice hot shower at the end of a long dusty day camping, do the dishes or wash your vehicle with hot running water and have all the conveniences of a bathroom at your disposal. We can help you choose the right outdoor hot water system for your needs. Whether it be camping, hunting, fishing, 4-wheeling, skin or scuba diving, surfing, canoeing, boating, backpacking, kayaking or sailboarding Deckers has the right portable hot water shower and bathroom system for you. RV owners, guides, cabin owners and even horse and dog groomers can now enjoy unlimited hot water where never before possible. Our goal is to provide you with useful information about our products and to help you make the right choices to suit your needs. You may place your order by mail, phone or over a secure server online. If you have comments or questions about our products or need more information, go to our Contact Us page. Thanks for visiting and we look forward to serving you. Set it in the sun or fill with heated water, give a few pumps with your foot and squeeze the handle on the spray nozzle to enjoy a nice hot continuous shower. Use it to rinse off after surfing, take a shower in camp or wash dishes. Completely portable and stows in a 5 1/2" x 8 1/2" carry case. Great for boats too. Unlike gravity camp showers that need to be hung overhead and produce dismal water pressure, Helio™ rests on the ground and delivers the pressure you need to wash hair, do the dishes, rinse off gear, water your plants, or wash the dog. This high quality innovative portable shower is engineered to last, just like all NEMO products. 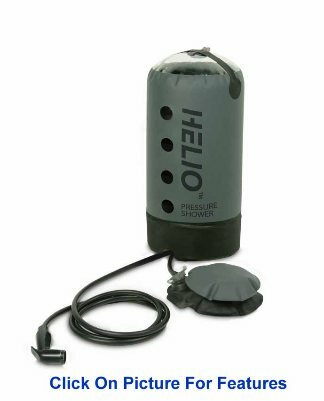 Helio™ is more portable than its competitors and can be filled from anywhere even without a hose. Its 2.9 gallon capacity is one of the largest on the market and comes with a 7 foot sprayer hose delivering 5-7 minutes of fully pressurized spray.